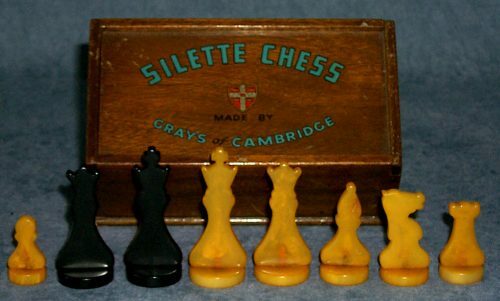 Silette Catalin Chessmen, 2-3/4″ King. Offered here is a fine set of Silette Catalin Chessmen offered by Grays Emporium of Cambridge. This set of unweighted chessmen has a 2-3/4″ tall King with a 1-1/8″ diameter base. These chessmen are a pleasing marbleized butterscotch and black Catalin casting of silhouette form mounted atop a circular Catalin disc. These particular Grays of Cambridge Bakelite Staunton Chessmen were produced around 1930. 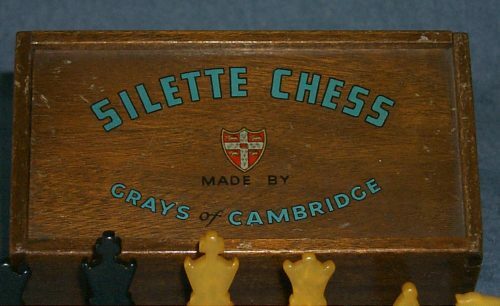 The chessmen are housed in its original wooden slide-top box bearing the “Silette Chessmen, Grays of Cambridge” label. 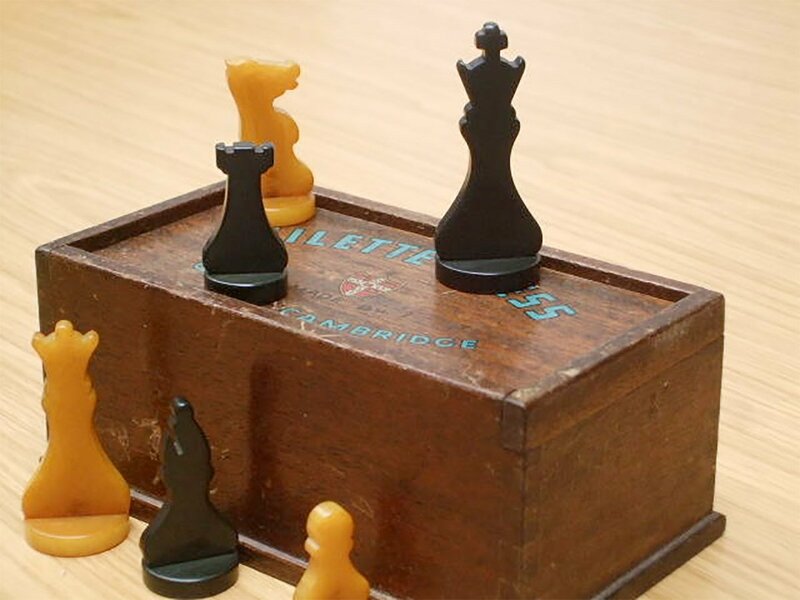 The chessmen are in excellent condition, the box exhibits some external scratching. Bakelite, or polyoxybenzylmethylenglycolanhydride, is an early plastic. It is a thermo-setting phenol formaldehyde resin, developed by Belgian-born chemist Leo Baekeland in New York in 1907. Baekeland was already as successful inventor due to his invention of Velox photographic paper, when he began to investigate the reactions of phenol and formaldehyde. Chemists had begun to recognize that many natural resins and fibers were polymers. Baekeland’s initial intent was to find a replacement for shellac, a material that was in limited supply because it was made naturally from the excretion of lac bugs. Baekeland produced a soluble phenol-formaldehyde shellac called “Novolak”, but it was not a market success. 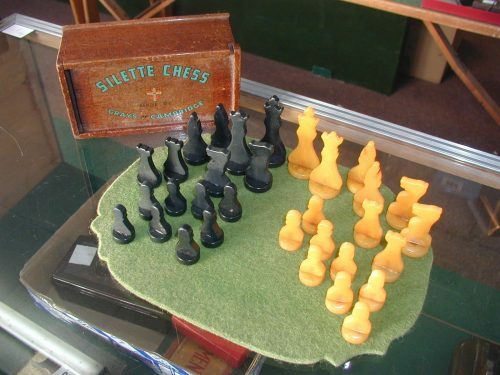 One of the first plastics made from synthetic components, Bakelite was used for its electrical non-conductivity and heat-resistant properties in electrical insulators, radio and telephone casings, and such diverse products as kitchenware and children’s toys. The “retro” appeal of old Bakelite products has made them collectible. The invention of Catalin revolutionized the manufacture of plastics during the Twenties and Thirties. When the Bakelite patent expired in 1927, the Catalin Corporation began producing a similar material under the name “Catalin”. A new coloring method allowed them to add fifteen colors to the available range. Catalin, in fluid form, could be easily moulded, and color added during the manufacturing process to create swirling marble effects. Catalin was also used in the production of radio sets and jewelry; a suitable medium for the new Art Deco style.